Is your blog any good? Unfortunately, many startups don’t get the most out of their blog. It’s the most important asset in your inbound marketing toolbox, and should be driving traffic to your site and helping your conversions. Examples like HubSpot and 37Signals bear witness to how priceless a loyal startup blog readership can be. Good blogging can even land you a gig as POTUS; Obama trounced Romney in the online marketing stakes, with Romney’s last blog post before the election garnering a miserable 2,146 views to this day. 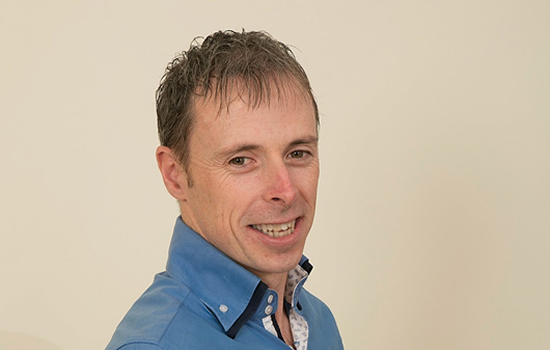 Eoghan: What kind of strategy did you devise before founding your blog? What kind of target market did you aim for, and what did you take into account to convert page views to sales? Ian: I identified the top 100 most influential people in social media and analysed them to see what area they focussed on. I found that very few had a technology background and even though most talked about tools on some of their posts none of them focussed on tools. With a background in technology and social I decided to focus on tools and technology for social media. There was a clear opportunity to own this niche. The target market for my blog is Digital Marketing Professionals and Small Business owners. In the US a small business owner is someone with revenue of less than $300 million per year so it’s a lot different than Europe. Although it’s an online site and we have subscribers from 75 different countries our main focus is the US market and this is where we have most subscribers. Our initial focus has been e-mail subscribers and we strategically place an test our e-mail subscription boxes on our site. On our home page we get 8% conversion rate for visitors to our site. We will be launching services over the next couple of months. Eoghan: Your blog has managed to carve out a substantial following from the already over-saturated market of social media blogs. What was your focus in the early stages of your blog when faced with such stiff competition? Did you seed your content with other blogs? Did you pay for traffic? Ian: Although there are thousands of social media blogs, there is no competitor directly in our niche. We focus on all the management tools and technology issues related social media and don’t write posts on the platforms (facebook, twitter etc). Carving out this niche has made a huge difference. Within 6 months of launching the blog we won a major award in the US for one of top 10 social media blogs in the world. This gave us huge credibility globally. We have never paid for traffic on the blog. One of our many ways of driving traffic and building our profile is writing for some of the largest social media blogs in the world. 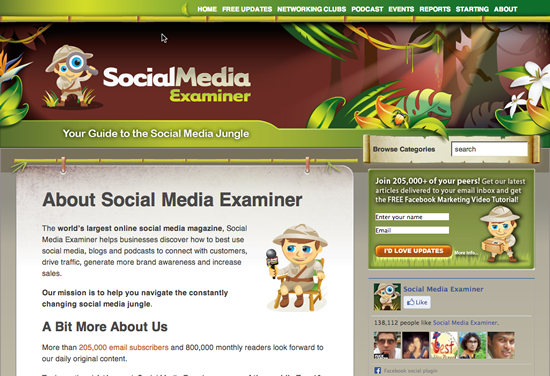 We write a monthly post for Social Media Examiner which goes to over 210k subscribers and they get huge traffic on their site. We’ve also written many other guest posts for sites such as convinceandconvert.com, jeffbullas.com, businessesgrow.com. Our blog posts have also been distributed to many other online sites with recent references to a post on New York Times. Eoghan: Featured blog posts and cross-posting is a collaborative trend that we see a lot. In fact, our blog posts at Bullet are featured on other great sites like DigitalMinistry and Viralblog. Strangely, the exact same one of our posts on one of those sites will garner 10-20x more views than the version posted on our blog. Do you have any advice for people dealing with this issue? Ian: Getting your blog posts on other larger sites can lead to increased exposure and can help build up your profile. Eoghan: Could you take us through the practical steps you take when writing a post, from idea to creation to promotion? What timeframe do you allocate to each step? Ian: This is pretty much the process I follow. – I then schedule them out. – The headline is extremely important so I’ll spend some time focussing on this. – We include a lot of images and screenshots to break up the content and help people that need the visuals. – I then promote the blog post which is where the real work comes in. On a recent post about Facebook competition apps I reached out to everyone I mentioned in the post and also reached out to competition providers that I didn’t mention. This lead to a lot of sharing and a lot of commenting on the post. I then post in many places. – For example, LinkedIn, LinkedIn groups, twitter personal and business, Facebook personal and business, Google +, Pinterest, BizSugar, Inbound.org, Scoop.it and many more! Eoghan: What are your top 5 blogs? 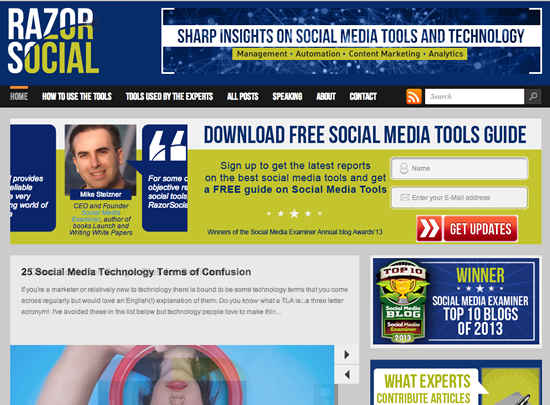 We don’t cover articles on all of social media but if you want information on social media tools and technology we are one of the best resources around. We provide a free social media tools guide which is available on our site and this will be very useful to your business. Well, there you have it! Is your blog operation as smart as Ian’s? It takes time and effort, but when executed properly a good blog can be a reliable (and cost-effective) asset to your startup’s marketing arsenal.